Spray cold grate of gas grill with grilling spray. Preheat grill for medium heat. Meanwhile, whisk together vinegar, sugar and pepper in small bowl until sugar dissolves. Add onion, cucumber and carrot; toss to coat. Set aside. Combine mayonnaise and Sriracha sauce in another small bowl; set aside. Grill franks 5 to 7 minutes or until hot, turning occasionally. Assemble sandwiches by spreading about 1 tablespoon Sriracha mayonnaise on each roll. 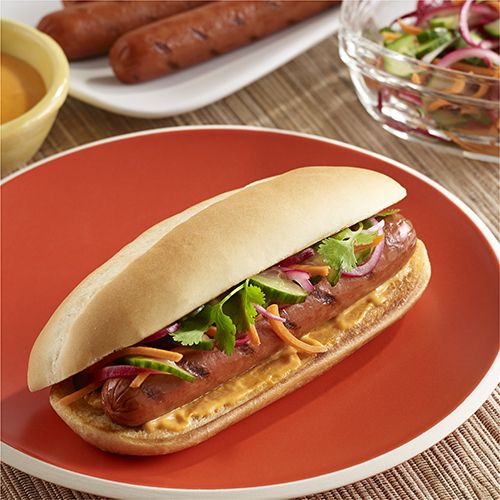 Place franks in rolls and top evenly with marinated vegetables and cilantro sprigs.